The Life of Ari: 4 Reasons Why I Love The Great Wolf Lodge! 4 Reasons Why I Love The Great Wolf Lodge! 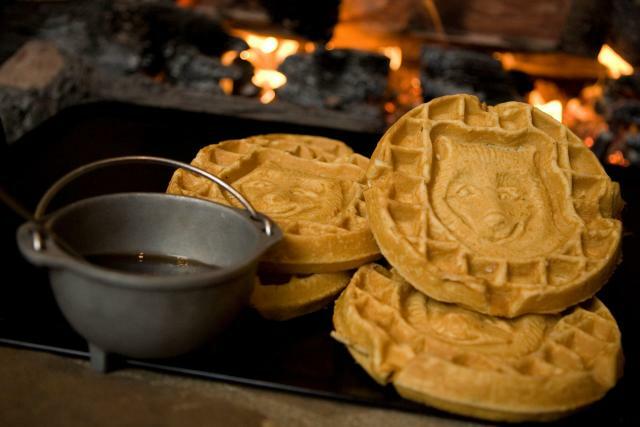 I know you guys have seen the commercials on every channel urging you to visit the Great Wolf Lodge. They have been relentless with their marketing! Everyday for weeks Adara was asking me could we go. I was so happy when they finally opened one up in Anaheim, CA. One day I happened to be browsing on Groupon and viola!! They had a deal on there for 50% off. We ended up going and had a ball. My husband and I were impressed with how much we actually enjoyed the resort! We had just as much fun as the kids. After that visit, I kept stalking Groupon periodically until I saw it on there again months later. We went a second time and had a great time once again. 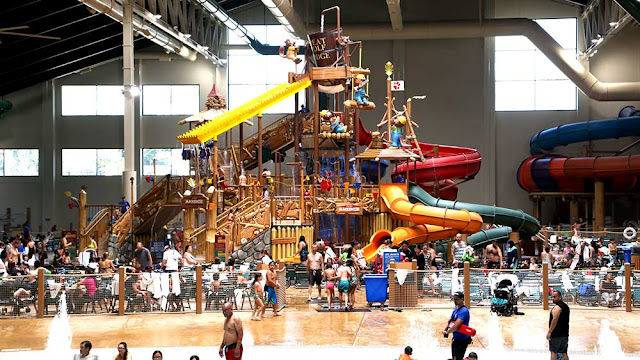 The Great Wolf Lodge is the perfect place to go for easy family fun. Here are there top reasons this is one of my family's favorite places to visit. The Great Wolf can be a bit pricey, I will admit, but for that one price, you get a full day and night of fun. Each room comes with 4-6 tickets to the water park which is reserved for hotel guests only. You could very easily spend your entire time in the water park. They have a lazy river, super cool splash zone, multiple water slides to accommodate every age group and a surf simulator among other attractions. They also have an outdoor pool if you want a break from indoor water park (the chlorine can be a bit much after a while). The little kiddie area is great for babies and kids who haven't learned to swim yet. It's like a mini water park in itself. The water over there is shallow so the babies can splash around. They have slides that aren't as intimidating too. Great for kids under seven. Come early if you can to grab beach chairs for your crew. The later you arrive, the less likely it will be for you to find a spot to sit. They provide towels so you can leave yours at home for this trip - one less thing to worry about! They keep the towels replenished at all time so they never run out. They also have safety vests in various sizes at every attraction. They have a restaurant inside the indoor water park where you can order salads, burgers, nachos and more. It even has a full bar! So Mom and Dad can get a cool cocktail while chilling and watching the kids have fun. WIN WIN! The water park tickets being included in the price of your hotel stay is a major plus. The water park stays open well into the night so the kids can swim their little hearts out. Also, on the day you check out, you can still use the facilities until 6pm! 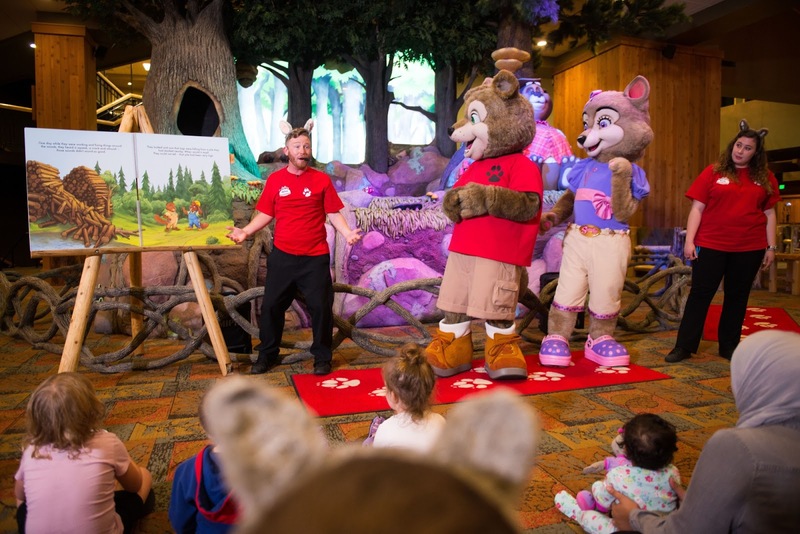 Every evening at 8pm, the Great Wolf Lodge has story time in their beautiful lobby. The characters come out with a giant story book and tell a cute story. The kids are invited to come down in the pajamas so it's like one big slumber party. It's so adorable! Usually by this time the kids are beyond pooped so after story time they are happy to get back to the room and get in bed. This is another cool activitiy thats included. And it's one of the things that I truly enjoy about the Great Wolf Lodge. Adara loves reading and story time. It's one of her favorite things about the resort as well. In addition to story time, they also do other things in the lobby like yoga, bingo, and arts & crafts. The last time we were there they even had a dance party right after story time! Let these kids shake off whatever energy they have left before bedtime! I've gone to Great Wolf twice and I have stayed in both the standard suite and the Wolf Den Suite. Both were great but when you get a themed suite, the magic happens for the kids. 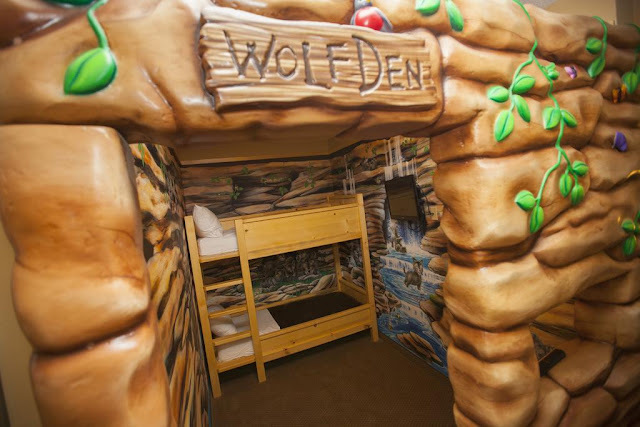 The Wolf Den suite has a tree house feel with faux green leaves covering the entrance. Inside, there is a set off bunk beds. The walls are painted like the great out doors and there is even a talking character inside the tree house! Adara loved the Wolf Den suite! I can only imagine what it must have felt like to be a kid sleeping in a cool room like that. It cost a little bit more but in my opinion it was totally worth it. Especially if you are luck enough to find it on Groupon like I did. Another bonus is every suite has a fridge and microwave so you can bring snacks, water and whatever else you want to cut down on cost. I love this. 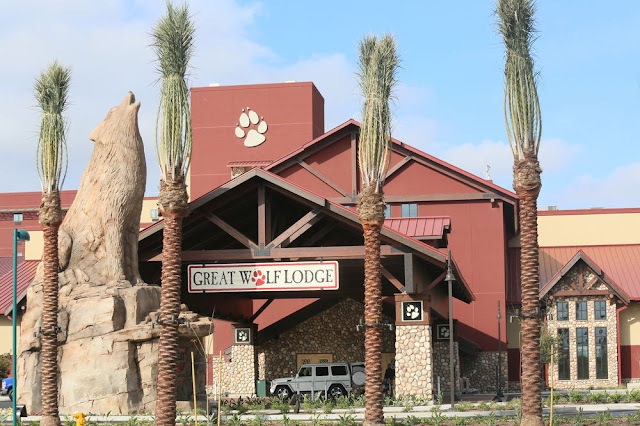 The Great Wolf Lodge in Anaheim has five restaurants, a bakery/ice cream shop and a Dunkin Donuts in the resort. That's plenty of options for the entire family! We have dined at most of restaurants and were not disappointed not one time. One night we had dinner at the Lodge Wood Fired Grill. 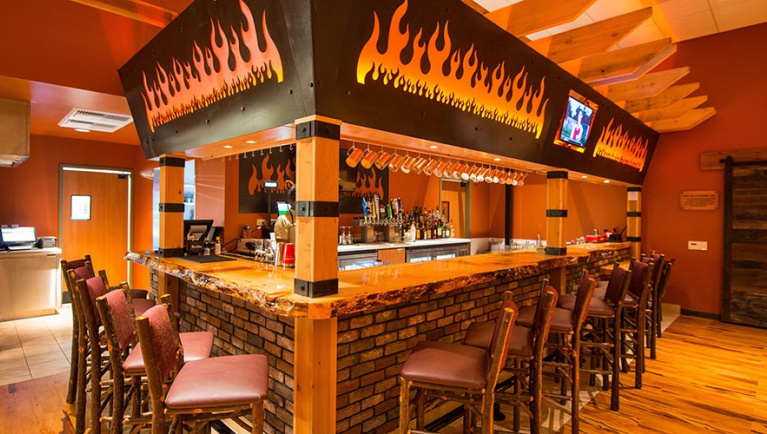 They have a nice selection of things like grilled salmon, steaks, appetizers galore but also cater to the kiddies with chicken strips and mac and cheese. The mister was impressed with the quality of the menu and the ambiance of the restaurant. They stay open until 11pm so that was also a plus if you are looking for a late night dinner. Their wine list is great and they have a nice selection of Tiki-inspired cocktails. 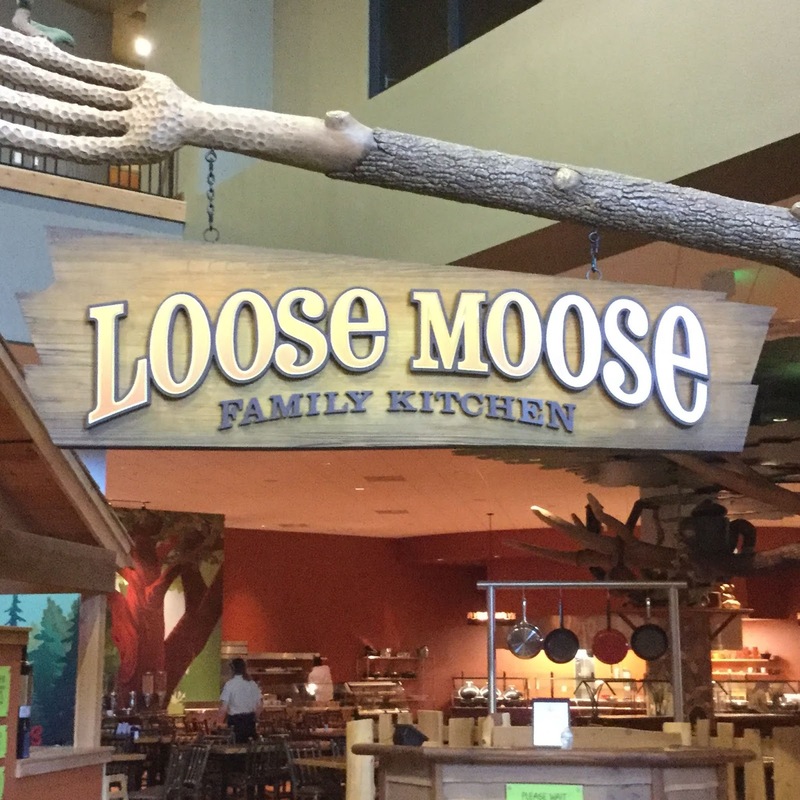 For breakfast, we love the Loose Moose Family Kitchen. This is the buffet-style restaurant with the amazing breakfast spread! They literally have EVERYTHING. Omelette station, waffle bar, fruit platters, fresh pancakes, fresh squeezed juices and everything in between. They also had turkey bacon, which was a major plus for us. There is ample seating and the service was impeccable. 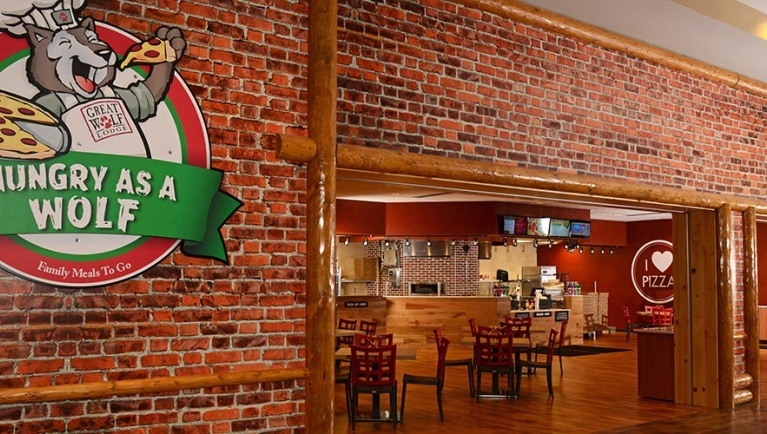 The spot that ate at the most was the Hungry as a Wolf Italian restaurant. The pizza is very good but their garlic cheese bread is AHH-MAY-ZING! We couldn't stop ordering it! It's so delicious! They have tasty salads and pastas all made for sharing. It's connected to the arcade so the kids can go play while you wait on your order. The pizza can take a while if it's crowded as everything is made to order. Buckets is the restaurant inside the indoor water park. Great for ordering food while you are in the midst of enjoying your day of fun. Their sweet potato fries are very good and the kids loved the nachos. The portions are big enough to share. Kids don't generally eat too much while they are swimming and playing so a few appetizers went a long way. The lines can be long so don't wait until the little ones are starving to decide to order food. Save yourself and be proactive! All in all, the Great Wolf Lodge is one of my favorite places to visit my family. We park our car and don't have to leave until we check out. I am looking forward to visiting again at some point this summer. Have you ever been to the Great Wolf Lodge? I'd love to hear all about it! If you haven't been yet, I highly recommend it! Hi there! I'm Ari - a Los Angeles based motherhood, travel and lifestyle blogger. I'll be sharing Mommy fashion and beauty tips as well as some of my favorite places to visit and things to do with my daughter, Adara. Thanks for stopping by! A Good Time Girl's Bday!!! !